Another week, and another set of predictions! 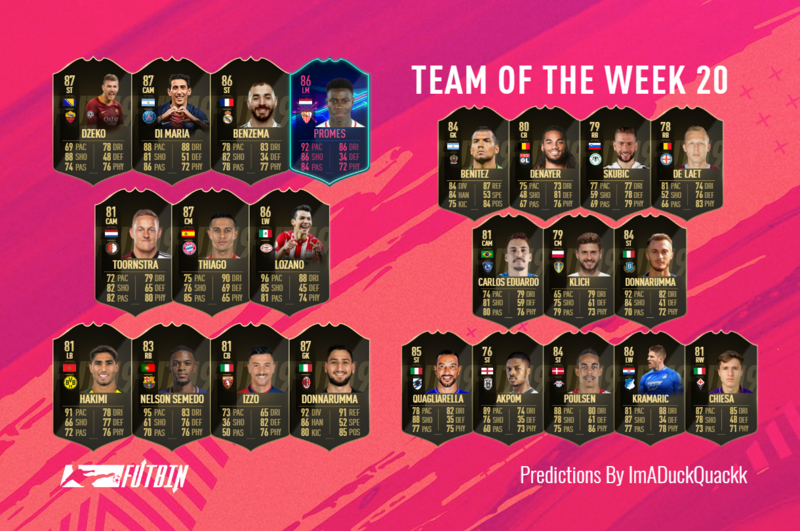 TOTW 20 is upon us, and while we have some big names featuring within these predictions, the lineup isn’t one that overly excites me. As usual, we’ve based our choices on stats, match ratings and results, let’s hope EA throw some surprises into the mix though! Our first selection this week was one that took a lot of consideration. EA always likes to include one bigger goalkeeper, which left us choosing between a third Inform Donnarumma or a third Inform Szczesny. AC Milan picked up a point with a 0-0 draw with Napoli this week. Donnarumma faced 15 shots, made 6 saves and kept the clean sheet, this was enough for us to give him our vote this time. Onto another centre-back now, as we head back to Italy with a match between Torino and Inter Milan. This time it was the home side who stole the show, with a single goal separating the two sides. Izzo was the hero on the night, not only was he incredible defensively, but he also was the only player able to find the back of the net. Against such high caliber opposition as well, surely he makes the final squad this week! Over to Spain next where we find Barcelona continuing their dominance atop the La Liga table. This week they were away to Girona, as they once again took all three points with a 2-0 win. Semedo was one of the superstars this time, not only did he help secure the clean sheet, but he was also the first name on the scoresheet after only 9 minutes. A fantastic performance from a right-back! Over to Germany now where Dortmund have been dominating the Bundesliga this year, scoring for fun and sitting comfortably atop the table. This week was no exception, as they took all three points with a 5-1 win at home to Hannover. Once again there is a whole handful of top performances to choose from, but with an assist, goal and solid defensive display, Hakimi takes our vote this week. Holland is our next destination, where we find a superstar clash between Feyenoord and Ajax. The math was an absolute goalfest, providing spectators with 8 goals, sadly for the travelling Ajax, 6 of these went in favour of the hosts, Feyenoord. There were too performances from across the squad, RVP scored twice, Berghuis scored once and assisted a further two, but Toornstra, with 1 goal and 3 assists, is the man who gets our vote this time. We sure love to include those more dangerous selections, so here’s another one to make the cut! Bayern picked up the points with a 4-1 home win over Stuttgart this week. Kimmich was great at the back, assisting twice, but a combination of the amount of defenders with top performances, and the lack of a clean sheet, left us looking elsewhere. Thiago took the highest rating from his central role, while also getting himself onto the score sheet too. Could this be enough for an Inform this week? PSG continued their dominance this week with yet another win, as they destroyed Rennes 4-1 at home on Sunday. Both Mbappe and Cavani were incredible once again, but with Informs in TOTW 19, neither are eligible for another upgrade so soon. Di Maria was also fantastic on the night, scoring once, assisting another and securing a solid match rating, all from a central position too. A controversial selection is up next, as we head across to La Liga where Sevilla obliterated Levante in a 5-0 win. As for selections, there are plenty of possible nominations, with Ben Yedder, Vazquez, Silva and Sarabia all making their way onto the score sheet. Our selection however goes with Promes, a goal, an assist and a near perfect match rating would usually be more than enough to make the cut, but will his recent man of the match card throw a spanner in the works this week. PSV played hosts to FC Groningen for their Eredivisie clash this week, and despite being the nailed on favourites, they only just managed to steal the points with a 2-1 win. Lozano was once again the saviour on the day, scoring both goals and putting him on course for his third inform of the season. Real Madrid have had anything but a successful season so far, but their recent form has shown improvement, and along with it some much needed points. This week, despite Varane being sent off, they took the points with a 4-2 win away to Espanyol, and with two goals, it looks like Benzema may have done just about enough to secure his first inform of the campaign. The final player to make our starting eleven this week, is yet another selection from Italy, but this time it’s one with plenty of goals. Roma drew 3-3 away to Atalanta this week, in a game that provided fans with numerous twists and turns. Dzeko did everything he could across the 90 minutes, taking the highest match rating, while also finding the back of the net twice. We already mentioned how our Serie A goalkeeping decision was a tough one, but compared to the selection we have from Ligue 1, it was a walk in the park. First up, let’s talk about the two that have just missed out. Allain picked up 5 saves and a clean sheet, with a fantastic performance against Monaco, while Reynet managed 4 saves, including one from the spot in A 0-0 draw on Sunday. Our selection, Benitez, seems to have just topped this, dealing with 14 shots, making 7 saves and securing the highest match rating this week. Anybody want to talk about scream cards? The constant stat changes and excitement they bring leave a lot to the imagination, so this week Denayer decided to take matters into his own hands. Lyon took home the points with a 1-0 away win against Amiens this week. Not only did Denayer help maintain the clean sheet, but he was the only man able to hit the target, scoring the games only goal. Konyaspor took home the points with a comfortable 2-0 win over Antalyaspor in their Super Lig fixture this week. It was a solid performance across the board from the hosts, however Skubic was astonishing from start to finish. Helping secure the clean sheet, providing an assist, scoring a goal and taking the man of the match award, this is a resume that is impossible to ignore. Australia is up next, and in a week where top class defensive performances were endless, we may as well include just one more within our predictions. Melbourne City picked up the points with a 4-3 win over Western Sydney Wanderers this week, and despite not managing a clean sheet, De Laet did manage to find the back of the net twice to help his side secure the points. Every week we do these predictions, and every week there are a lot of Championship fans dreaming of their clubs securing a spot. Well for you Leeds fans out there, today could be that day! Leeds fought back from a goal down to secure a 2-1 win away to Rotherham this week, keeping them on track in the title race. Klich was the man behind both of these goals, and all from a central position. With the lack of Premier League matches this week, this could be his time to shine. Al Hilal were on the road this week as they travelled to Al Fayha for their league fixture this week. The match provided fans with a massive 6 goals, 5 of which went in favour of the guests. Soriano up top found the back of the net twice in a fantastic performance, however our nomination goes with the midfielder, Eduardo, who also managed to achieve this success. Back across to Italy now, where an absolute thriller between Chievo and Fiorentina provided fans with a massive 7 goals. The points went home with the visitors, Fiorentina, who edged out the match with a 4-3 victory. Chiesa was sensational on the wing, scoring twice and taking the man of the match award too. Another tough decision here, as we take a look at Hoffenheim’s 4-2 win over Freiburg this week. Based on stats alone, Demirbay secured the highest match rating, while also picking up a goal and an assist along the way. Despite this, we have decided to go with Kramaric, who also had a sensational game and managed to score twice. This one however could really go either way. Sampdoria were at home this week as they welcomed the travelling Udinese for their Serie A fixture. It was one way traffic on the day, as the hosts piled on the pressure and took the points with a 4-0 win. Quagliarella was in superb form on the day, assisting once and scoring twice from the spot, just falling short of his hat-trick. Heading back across to Germany now, where Leipzig continued their impressive season with a 4-0 win away to Dusseldorf this week. The team were fantastic, with goals from Laimer, Konate and Poulsen. Poulsen however found the net twice, while also taking the man of the match award, so for us, he is deserving of that second Inform here. Hat-tricks were extremely rare this week, with almost nobody quite managing to score that third goal. Our next selection follows this pattern, but with 2 goals and an assist, they couldn’t have come much closer. PAOK picked up the points with a 4-0 win this week, and after playing a part in almost every goal, Akpom cruises into this final lineup. So here it is, the last selection for this week’s predictions and the only hat-trick I was able to find too! Brescia and La Spezia shared the points with a massive 4-4 draw this week. Donnarumma however took home all the awards, scoring not once, not twice, but three times, ensuring he did everything he possibly could to keep his side in the match.